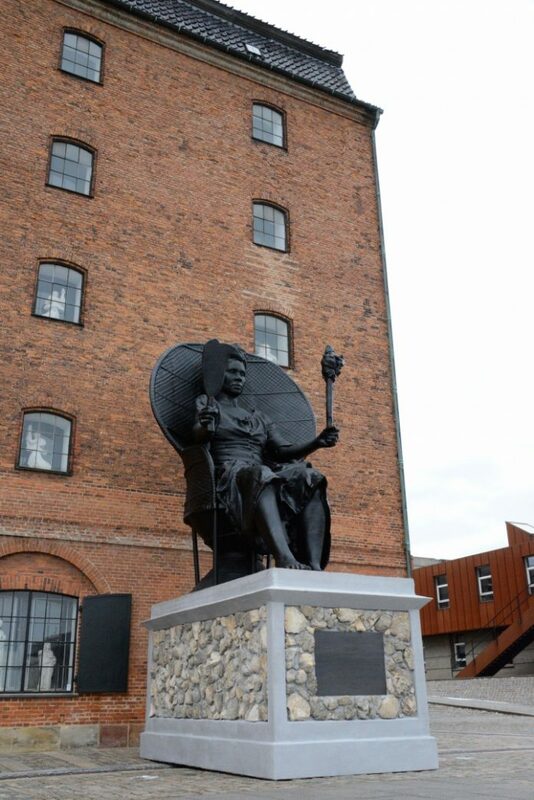 COPENHAGEN — A Trinidad and Tobago artist has made history by collaborating to create the first public monument to a black woman in Denmark. Tobago-born, St. Croix-based artist, La Vaughn Belle, collaborated with Copenhagen-based Jeannette Ehlers, to create “I Am Queen Mary,” a tribute to Mary Thomas, a 19th-century freedom fighter who led a major uprising on St. Croix, one of the Virgin Islands that was then part of the Danish West Indies. The statue was unveiled in March 31 at the Danish West Indian Warehouse in Copenhagen and marks 101 years since Transfer Day, when Denmark sold St. Croix, St. Thomas, and St. John to the United States for $25 million. The statue is painted entirely black and rising nearly 23 feet on a hefty pedestal. Thomas is shown seated in a position of power and government. Thomas was an important leader of the ‘Fireburn’ labour revolt on St. Croix. The Fireburn began on October 1, 1878 as an uprising against the contractual servitude that continued to bind workers to the plantation system after the 1848 abolition of slavery in the former Danish West Indies. The insurrection was for better working and living conditions and involved burning down most of Frederiksted town as well as sugar cane fields on a great number of St. Croix’s plantations. Along with Mary Thomas, the three women Axeline ‘Agnes’ Elizabeth Salomon, Matilde McBean and Susanna ‘Bottom Belly’ Abrahamsson led the largest labor revolt in Danish colonial history. They were arrested and sent to Denmark in 1882 to serve prison sentences in Christianshavn’s Women’s Prison. Their sentences were later commuted and they were returned to St. Croix and venerated in U.S. Virgin Islands cultural mythology as the Queens of the Fireburn. There are folksongs dedicated to Queen Mary and a highway named in her honor. Belle, whose roots also extend to Barbados, also teaches at the University of the Virgin Islands and own a few businesses – a Latin dance studio, House of Clave, and a guesthouse, Trumpetbush Manor – with her husband, Rivert Diaz. She moved to St. Croix at age 7. Her work borrows from elements of architecture, literature, history, archeology and social protest to create narratives that challenge the colonial process. She is best known for her work reinterpreting the material artifacts of colonialism and uses her work to create a form of alternative archive that challenges the colonial narrative. Belle has exhibited her work throughout the United States, Europe and the Caribbean in such institutions as the Museum of the African Diaspora, San Francisco, El Museo del Barrio, NY, Arts of the Americas Museum, Washington, DC and the Royal Library of Denmark and the Centro de Wilfredo Lam, Cuba.